Jump To120: "Can't get out that way. "121: "Here comes trouble! "122: "Give me that blaster! "123: "He's the brains, sweetheart! "124: "Into the garbage chute, flyboy! "125: "Women! "126: "What an incredible smell you've discovered! "127: "Will you forget it? It's magnetically sealed! "128: "There's something alive in here..."129: The Dianoga's Tentacles of Doom!130: Chewie Tears the Dianoga Apart!131: "Try to brace it with something! "132: "They're madmen, sir! "133: Stealthy Ben Kenobi134: Ben disables the Tractor Beam135: "We're all gonna be a lot thinner! "136: "From now on, you do as I tell you. OK? "137: Big Walking Carpet138: "Luke, get the Princess back to the ship! "139: "Then it's a wonder you're still alive. "140: Han certainly has courage141: "They've run into a dead end! "142: "Look, an open hatchway! "143: "For luck..."144: "We made it—Howard Chaykin! "145: "Get to the ship"146: It's now or never...147: "I'll just make it. "148: "Obi Wan, the circle is now complete"149: Kenobi vs Vader!150: "You can't win Darth"151: "Heed my words..."152: Obi Wan disappears!153: "Ben!!! "154: "I can't believe he's gone..."
c.1983? | age 14? It’s the big swashbuckler-style swing across the chasm! And it looks very like Howard Chaykin’s version. Hmmm… But if only I’d better understood the ‘direction-of-action’ in my panels. 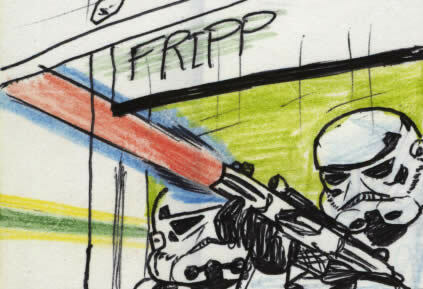 FRIPP — ZOW — ZROW — ZZZ — ZAK! My instinct, based on the previous page, is that Luke and Leia should be swinging left to right. They seem to be swinging towards the Stormtroopers who they are fleeing! But actually, Howard’s version in the Marvel comic does the same thing and he gets away with it. 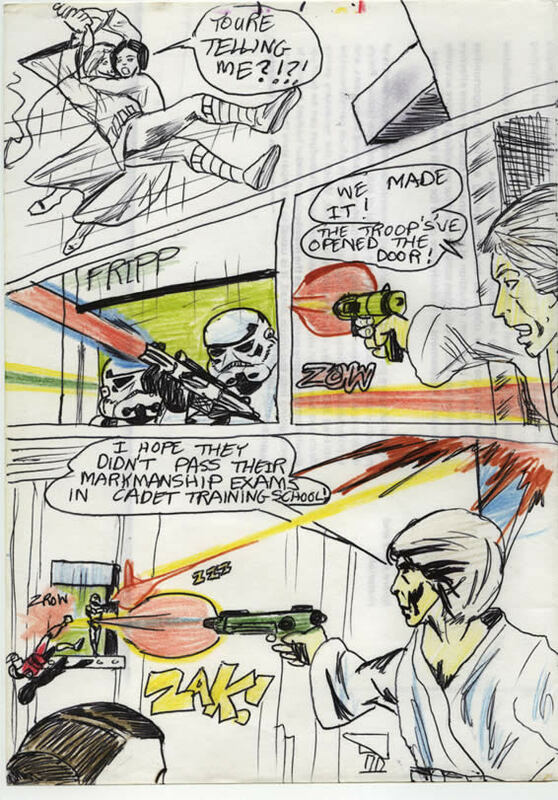 Perhaps it’s because he didn’t put in my extra panel of the Stormtroopers shooting under the door, apparently facing towards Luke and Leia—who are supposed to be swinging away from them! (Sorry if you’re confused). So what about these frequent similarities between Chaykin’s comic version and mine? This might come as a shock but I might… (are you sitting down?) …it looks as if I might have copied some of Chaykin’s work from the Marvel comic. Or is there another less convenient explanation? It just «feels unlikely to me, having given it much thought, that Howie slipped into my 1983 bedroom at night via a wormhole, to microfilm my precocious epic and then went back to 1976 and made his version from mine. Howard Chaykin: Innocent? Why is he looking at me like that? wouldn’t have had to ink Issue#1 by himself to meet the severe deadlines. wouldn’t have sometimes made the film look so odd! He’d have jumped forward to get proper production stills from after the film was made, taken them back to 1976 and used those to more accurately draw the movie! But none of those things hapened, because he couldn’t time-travel. ERGO: He probably didn’t steal from my work. What does this mean? The easy answer is the one that you may already have guessed, readers. That I copied from him. But that’s just all too convenient an explanation. No, no, no. Here’s the real explanation. Simply put: by the most incredible coincidence, wee John, in a wee village in wee Ireland was coming up with some very very similar images in his own wee comic. I know, it’s funny because it feels so outlandishly implausible.